SAS QUEEN MODJADJI (S103), the third and final submarine to be built in Germany for the South African Navy, was handed over to a South African crew at a ceremony in Kiel, Germany last Thursday (31 January 2008), who will now complete their training in her before sailing the boat out to South Africa. 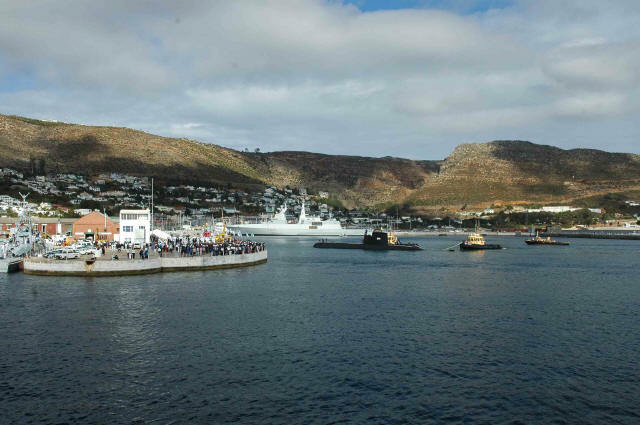 The submarine is expected to depart Germany on 2 April, arriving in Simon’s Town on 22 May where she will join her two sisters, SAS MANTHATISI (S101) and SAS CHARLOTTE MAXEKE (S102). The new submarine is one of three Meko class 209, Type 1400MOD and is 62m in length and 7.6m wide. She displaces 1450 tons surfaced and about 1590 tons submerged. The sub is powered by four MTU 12V 396 diesel engines which give her a speed of 10 knots surfaced and 21,5 knots dived. For weapons the submarine is armed with 14 torpedoes. She carries a crew of 30. 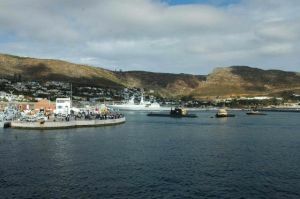 Delivery of the submarine completes the controversial naval element of the arms deal. The boat is named for the legendry Rain Queen Queen Makobo Constance Modjadji (pronounced Moo-jad-chi) who died in 2001 and who, it is said in some quarters, was descended from the house of the kingdom of Monomotapa, the kingdom credited with the creation of the Zimbabwe Ruins. In her lifetime Queen Mudjadji was ruler of the Balobedu people and known internationally as a rain-maker. The role of the rain queen was immortalised by 19th Century writer Rider Haggard in his book ‘She’, as ‘She who must be obeyed’.